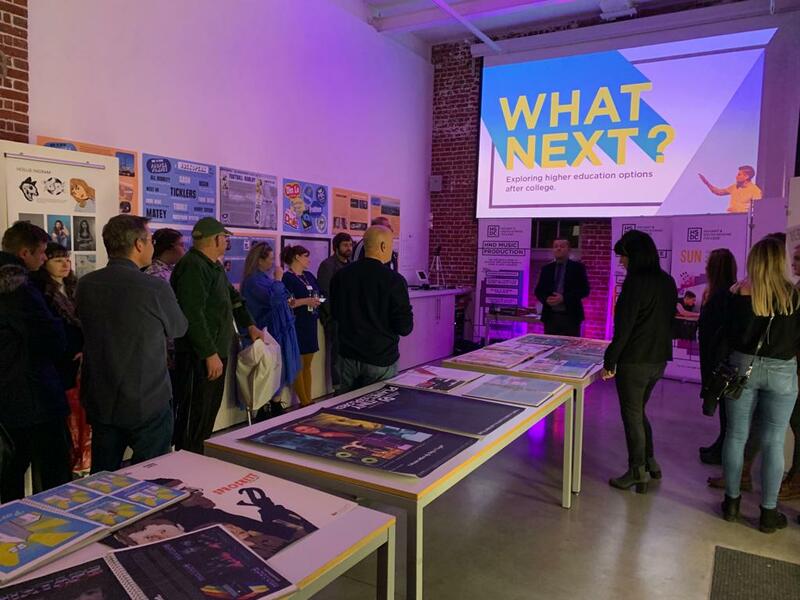 Havant & South Downs College (HSDC) students explored their post-College options at a Higher Education (HE) event held at the Aspex gallery in Portsmouth. Creative industries from the local areas came together on 29 November to showcase different pathways to HE. Funded by the Southern Universities Network (SUN), the event demonstrated to Level 3 students that HE isn’t just writing assignments, but about doing real, practical, employer-focused activities. The fun and informative evening comprised of short talks and presentations from lecturers and former students, as well as showcases of student work. HE Manager, Dom Thompson, said: “We decided to work with the Aspex Gallery to put on this ‘creative industries’ showcase. It was a celebration of media, graphic design, photography and music. It was open to the public and was open for parents as much as to students. “I would say there were about 100 people there in total. It was a real cross-College effort – music lecturers Jonny Callendar and Gary Wood were there with their Native Instruments equipment demonstrating what they do. Dom continued to say the event is ‘the first of many’. He said: “We are going to run a selection of progression events that highlight different interest areas to show students ‘this is what we do at HSDC but this is what you can progress to after College’. To find out more about HE courses at HSDC, click here.